You say you’re going to Portland for the forested hikes, the riverside views and the tax-free shopping. But let’s face it—you’re really just going to eat. The city is crammed with just about anything you’d want to sink your teeth into, plus a veritable sea of libations with which to wash it all down. Your best plan of action is to take a culinary tour of the city, one walkable neighborhood at a time. Rich in old Portland history, though still rough around the edges, Old Town is emerging as one of the city’s most exciting food destinations, especially with the recent opening of Portland’s first food hall, Pine Street Market. There you’ll find outposts from many of the city’s most successful restaurateurs. Think over-the-top hot dogs from Olympia Provisions’ OP Wurst, spicy roasted chicken from John Gorham of Toro Bravo fame and mind-boggling ice cream creations at Salt & Straw’s Wiz Bang Bar (pork soft serve with marionberry magic shell?!). When you’re done noshing, walk or bike along the river at Tom McCall Waterfront Park (Kerr Bikes even rents four-person surreys) or meander through the tranquil Lan Su Chinese Garden. On weekends, the Saturday Market lures shoppers with its huge array of handmade goods. Got gaming on the brain? Head to the Ground Kontrol ’80s-themed arcade, and be sure to check out the Pac-Man-tiled bathroom while you’re there. Although it’s been more than a decade since it earned the moniker “Trendy-Third,” this stretch of the Alphabet District is still a top shopping and dining destination. Here you’ll find all the big players: the bizarro world of Salt & Straw ice cream (care for a scoop of fish sauce caramel? ), the wait-worthy Bamboo Sushi, exquisitely inventive Spanish tapas at Ataula and upscale bistro plates at St. Jack. The area is also fast becoming the locale for second and third outposts of city favorites such as fresh-pasta-focused Grassa, Lovejoy Bakers and Boxer Ramen. If spirits are your thing, you’ve got three distilleries to choose from: Clear Creek, Bull Run and Aria Portland Dry Gin. Walk off your calories by shopping your way through the street’s many luxe boutiques, or hike through adjacent Forest Park—the Macleay trailhead is a short walk from the north end of the street. Loudly and proudly wearing its old industrial vibe, this area, just across the river from downtown, is ground zero for the Portland craft movement. From exquisite Alma hand-made chocolates to Oregon-harvested Jacobsen salt, makers reign within this mile-long stretch of vintage warehouse chic. Sip the Belgian ales at The Commons Brewery, or taste aged brews at Hair of the Dog Brewing Company. Enjoy a cuppa at Stumptown Coffee’s headquarters, or taste a tea flight at Smith Teamaker’s serene new space. Distillery Row’s eight producers are ready and waiting if you want to take a deep dive into their more than 20 locally made spirits. Just check out the map and tasting room guide (distilleryrowpdx.com). Or head straight to House Spirits’ brand-new $6 million distillery and tasting room. To sustain yourself during all that imbibing, don’t miss acclaimed Russian hot spot Kachka. And ramen junkies have no fewer than four spots to choose from: bold favors at Boke Bowl, white-hot Japanese import Marukin Ramen, beloved izakaya Biwa and its noodle spinoff, Noraneko. This southeast Portland neighborhood was once home to gritty auto body shops, thrift stores and humble bungalows, but in a few short years, it’s been transformed into one of the city’s hottest dining destinations. Pok Pok and its neighboring Whisky Soda Lounge anchor the strip, but don’t miss the chef-driven Indian street food at Bollywood Theater, refined Mexican cuisine at Xico, and fantastic sandwiches and salads at Roman Candle. 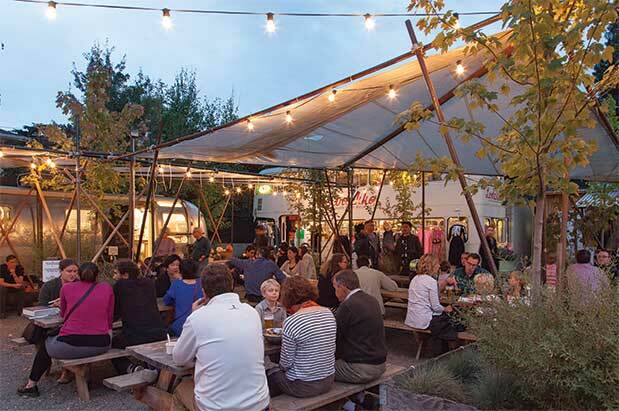 Or for variety, head to Tidbit Food Farm and Garden, featuring a pod of some of the best food carts in the city, and fully outfitted with amenities such as bathrooms, sheltered tables, a fire pit and—most important—pints of craft beer. Division’s dessert options abound, including the flaky pies at Lauretta Jean’s and stellar gelato at Pinolo Gelateria. If you’re looking for the highest concentration of Portland clichés in one place, look no farther than Mississippi Avenue. It’s all here: food carts, craft breweries, live music venues, free-range chickens and super-specialized boutiques peddling everything from taxidermy to comic books to worldly salts and cocktail bitters. If Disneyland had a Portland Adventure attraction, it would probably look a lot like this. Just sit back and enjoy the ride, because it’s pretty delicious, especially the beers at family-friendly Ecliptic, the phenomenal Israeli sandwiches at Wolf & Bear’s cart, the scoops at Ruby Jewel and the gorgeous, seasonal, wood-fired pizzas at Lovely’s Fifty Fifty. Makes a perfect home base for food lovers, sitting as it does above Imperial, one of the city’s top restaurants and bars. Even better, it offers guests free Oregon craft beers in the lobby from 5:30 to 6:30 p.m. every day. A newly renovated Euro-style lodging house that holds a special appeal for millennials, offering rooms that range from private with a shared bath to hostel-style bunks ($56.25 per person). On Robson Street near Vancouver’s West End, the folks behind Forage (the 5-year-old locavore restaurant with a strict no-waste policy) have opened Timber, which serves Canadian comfort food for conscientious sports fans. Say hello to the stuffed beaver at Timber’s door, then pick your seat based on which hockey game you want to catch on TV. Flannel-clad servers can explain the classics—the poutine ($12) is made with deeply flavorful vegetarian mushroom gravy—but your best bet is to just dig in, smug in the knowledge that no food, materials or extra energy was wasted in the making of your meal. Dip the fried Québécois cheese curds ($7) in house-made ketchup that’s made by the “fermenter-in-residence,” take down the giant bison burger ($18; beef is limited for sustainability purposes), or try the spiced, flaky take on tourtière ($20), the classically French Canadian game or fish pie. Just don’t expect your condiments to come in plastic squeeze bottles. The 18 rooms in this boutique hotel were designed by local aboriginal artists. Just a few minutes’ walk from Gastown, the property also has 24 shelter-rate apartments for community members at risk of homelessness, a street-level fair trade gallery and a rooftop sweat lodge. A historic Roaring ’20s throwback and former retreat for Hollywood royalty, including John Wayne, Errol Flynn and Elvis Presley. A highway winds through bucolic pastures and over gentle hills as it takes drivers west from Interstate 5 toward the historic port town of Astoria, Oregon. Grand and elegant buildings stand proudly, the heaving Columbia River ever present in the cool, salty air. Astoria is a town where artists thrive and characters abound. Anglers and chic LA transplants alike sip coffee at Street 14, Micha and Jennifer Cameron-Lattek’s corner coffee shop, where everyone seems to know everyone else’s name. The couple—who bought the coffee shop attached to the Commodore Hotel in 2012 on a lark while they were still living in Berlin—started serving dinner (Thursdays–Saturdays) in the fall, and you’ll want to make a point of eating there. Chef Andrew Catalano comes to Astoria by way of New York City’s Gramercy Tavern and Maialino, and Portland’s Ned Ludd, and the ever-changing dinner menu (items include superb fish stew, freshly picked lettuces and garden produce in salads, house-made spaghetti cacio e pepe; entrée prices average about $20) is executed with precision and soul. In fact, Astoria is increasingly a worthwhile destination for locally sourced foods. Consider having lunch on the pier at Clemente’s, a bright and airy spot with open-beamed ceilings, a peek-a-boo view of the river and the most remarkable crab cakes ($14) around. (One waiter said he’d seen folks return to have them again for dinner the same night.) A few steps down the pier at Frite & Scoop, Lisa and Kevin Malcolm serve small-batch ice cream ($2–$5.50) with house-made ingredients (for example, fresh lime curd swirled into sweet cream custard, and a life-changing rocky road with house-made marshmallows and Callebaut chocolate), alongside twice-fried Belgian frites ($4–$8) with a choice of dipping sauce (we like the malt vinegar aioli). Meander down a block to Imogen Gallery, which sells works by local potters, painters and woodworkers; then stop into Maiden Astoria, a “makers’ gallery,” to pick up a cozy, screen-printed fleece sweatshirt and browse locally made jewelry and art in a chic, bright storefront. Built on a pier where a fish cannery once stood above the Columbia River, this hotel offers 46 rooms, each with updated, contemporary décor, a gas fireplace and a small balcony overlooking the river. An afternoon wine-and-cheese happy hour in the lobby, with its soaring two-story windows (or on the riverside patio, weather permitting), sets a festive tone. Best of all? The hotel offers complimentary chauffeured rides to downtown in a classic car. Just ask! With a brewery, new dining options and culinary events, Eugene, Oregon, has graduated to become a food-focused destination. In the past decade, anchored by Ninkasi Brewing, the restaurant Marché and the growth of the quirky Oregon Truffle Festival each winter, Eugene—home of the University of Oregon—has blossomed into a food town worthy of a full weekend visit. Begin your weekend by arriving on a Friday evening and pulling into Izakaya Meiji Company for a whiskey or sochu tasting and a late-night bowl of ginger-laced tonkotsu ramen before crashing at Inn at the 5th. On Saturday morning, after a café au lait at the coffee shop inside Provisions Market Hall (a refined Oregon-centric grocery store and kitchenware shop), take a walk along the city’s extensive Ruth Bascom Riverbank Path, then spend the morning cruising the giant food- and craft-stuffed Eugene Saturday Market downtown, where you can taste ever-changing brews (think sours, cherry perry and juniper cider) from WildCraft Cider Works, whose fruit all comes from wild orchards nearby. For lunch, try the high-piled Reuben at Falling Sky Pour House & Delicatessen, which may be the first spot to successfully combine a beer brewery with a real Jewish deli. It’s location, location, location. Although the parking-lot views aren’t exactly quaint, great service, well-appointed rooms ($209–$280), relaxing spa services and that location make this Eugene’s best choice. Whidbey Island is one of those rare places—“gastronomagical,” I call them—where all manner of culinary delights seem to thrive. Organic produce. Beer. Wine. Seafood. Even award-winning cheese. Farmers and talented chefs have turned this 55-mile, sea-sprayed stretch of land into a foodie playground. My recent island tour started at Cadée Distillery, one block from the Clinton ferry terminal. In a tiny tasting room lined with handsome bottles, 20th-generation distiller and native Scotsman Colin Campbell led us through tastings of his small-batch spirits, including a citrusy gin and aged whiskeys (tastings $3–$5). Be sure to try the Cascadia rye whiskey, double barrel finished in French oak casks previously used for aging 20-year-old port. With the salty ocean breezes still in our hair, my husband and I headed south to Glendale Shepherd, a family-owned dairy farm specializing in sheep’s milk cheeses and pasture-raised lamb. There we enjoyed free tastings of the exceptional artisanal cheeses (consider taking home the Tallulah, a smooth and nutty washed-rind, soft-ripened cheese) and unparalleled beauty of the woodsy farmstead. Tour and tastings are $20–$25, Monday–Saturday. From there, we headed north on State Route 525 to Oak Harbor for dinner at Frasers Gourmet Hideaway, a hidden gem that locals gush about. Behind the illuminated onyx chef’s counter, Scott Fraser crafts impressive French classics with a Salish Sea twist. His curry cream broth is a fragrant and delightful way to enjoy the island’s famous Penn Cove mussels ($12). Whidbey Island’s culinary glory was cemented for me on our second night, at Orchard Kitchen, a teaching kitchen and dining room in Langley. Chef and Whidbey native Vincent Nattress and his wife, Tyla, host convivial, prix fixe four-course dinners ($55–$65, Fridays and Saturdays) inside a rustic farmhouse using produce from their 5-acre organic farm. They also offer classes in cooking ($85) and wine tasting ($100) on Saturdays and Sundays, lunch included. Cadée Distillery: 8912 State Route 525, Clinton; 360.969.5565; cadeedistillery.com. Just north of the Washington-Canada border lies British Columbia’s Okanagan Valley, a region that is, geologically speaking, part of the Sonoran Desert that winds its way up the continent from Mexico. In Washington and British Columbia alike, the glacially formed region gets very little rainfall. On the U.S. side, that means fruit and rodeo country, come summer. Cross the border, however, and you’ll find a bustling Napa of the north, known internationally for siphoning all that sunshine into a vast array of really good wine—and, increasingly, of interesting food. Last June, we planned a multiday food and wine tasting trip to explore this region, which is about a five-hour drive northeast of Seattle. Since the Okanagan is also known for road biking, we aimed for a net-zero culinary vacation that would allow us to eat our way across the valley while expending plenty of energy pumping up and down its rolling hills. I’d learned on previous visits that the region’s wine is unfailingly interesting—often mineral forward, usually unlike whatever I’ve grown to expect from a given varietal and almost always inexpensive. What I’d missed was the smattering of destination winery restaurants with stunning views. The first night, we landed for dinner at Miradoro, a gorgeous cantilevered box of a restaurant perched next to Tinhorn Creek Vineyards, where we swooned over cucumber gazpacho with mint and pickled spot prawns, and then corn-crusted fried chicken (entrées average about $35). Looking out over Lake Osoyoos after a summer thunderstorm, listening to the various accents at the tables around us, we sighed into our espresso, congratulating ourselves on finding what felt like a shortcut to a European vacation before winding our way down to Watermark Beach Resort for the night. Because the Okanagan is a valley, getting to any winery usually means a climb—not an issue with a car, but something to think about on a bike. By 10 a.m. the next morning, we’d already biked 8 miles, earning our right to sip a refreshing Bordeaux-style Sauvignon Blanc and Semillon blend called Alibi at Black Hills Estate Winery’s tasting room. Two miles later, as we eyed the huge oak aging barrels at the new Bartier Bros. tasting room, which winemaker Michael Bartier uses to impart just a hint of oak to his bright, crisp Chardonnays, I was beginning to wonder whether I’d survive our 25-mile route that day. Over the next 3 miles, we stopped at a few more wineries on impulse, then huffed up to the impressive tasting castle at Road 13 Vineyards, whose tagline, “It’s all about the dirt,” expresses the region’s general obsession with its terroir and its pride in how even the most predictable varietals turn out differently from vines grown in Okanagan earth. After a few more wineries and a solid nap on the hotel’s beach, we drove an hour and a half north to eat and drink at Mission Hill Family Estate, generally credited for bringing Canadian wine onto the world stage. Perched atop a hill on Okanagan Lake’s west bank, the winery embodies both the grandiose style of a religious mecca and the kind of collegiate campus feeling one gets at large, well-respected wineries like Napa’s Mondavi. But it also has The Terrace, a restaurant with a menu created to complement its most famous bottles. After a tour of the winery’s cleverly designed underground aging caves, we dug into a short-rib dish at The Terrace—steak rubbed with toasted cardamom and coriander, braised, and finished with a blueberry, cherry, and mustard jus—that perfectly affirmed our decision to splurge on a bottle of its Oculus red wine, which has developed a cultish following. The next morning at brunch, we shared the famous potato cakes ($12) and a salmon Benedict ($18) at Poplar Grove Winery’s popular Vanilla Pod restaurant. Then it was back on the bikes for a ride along Okanagan Lake, about 75 miles north of the border. On Naramata Road, we cycled up and down rolling hills, tasting 50 shades of bubbly at the Bella Wines sparkling-wine house, ogling the wine labels at Laughing Stock Vineyards, gazing at the lake from Bench 1775, and finally stopping for Portuguese tapas—including crispy fried smelts ($7) and lamb albondigas ($8)—at The Kitchen at Misconduct Wine Co. TIP: Call ahead and asked to be seated against the glass, as long as you’re not afraid of heights. TIP: Order the short rib. TIP: Order the crispy potato cakes—think latkes with a Mexican accent. TIP: Ask the server to tell you the wine label’s story. TIP: Try the rosé. It’s different. TIP: The Viognier is a great deal. TIP: We loved the fresh, mineral-forward Cabernet Franc. TIP: Look for sesame oil and smoke in the 2012 Syrah; it’s quite unusual. TIP: Splurge on a bottle of Oculus to save for a special occasion, or sign up for a tasting of the “Legacy Collection." And don’t miss the art. TIP: Ask if they have any wild-fermented bubbly available. TIP: Each bottle is labeled with the closing stock ticker tape published on the day the wine was bottled—a reflection of the owners’ previous lives in the financial industry. TIP: Take home the 2015 Sauvignon Blanc and drink it with fresh oysters. A family-friendly lakeside resort with easy beach access. The condos ($152–$282) have modern kitchens and porches overlooking the lake.